1. Define educational psychology and discuss its scope. 2. "Early development is more critical than later development". How? Describe the role of heredity in human development. 3. 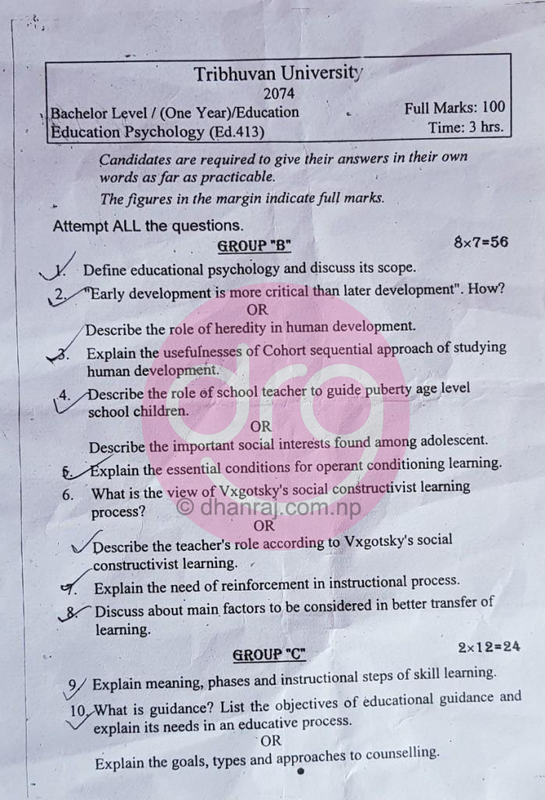 Explain the usefulnesses of Cohort sequential approach of studying human development. 4. Describe the role of school teacher to guide puberty age level school children. Describe the important social interests found among adolescent. 5. Explain the essential conditions for operant conditioning learning. 6. What is the view of Vxgotsky's social constructivist learning process? Describe the teacher's role according to Vxgotsky's social constructivist learning. 7. Explain the need of reinforcement in instructional process. 8. Discuss about main factors to be considered in better transfer of learning. 9. Explain meaning, phases and instructional steps of skill learning. 10. What is guidance? List the objectives of educational guidance and explain it's needs in an educative process. Explain the goals, types and approaches to counselling. 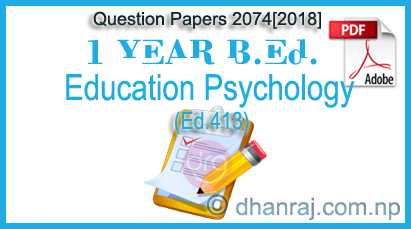 0 Response to "Education Psychology (Ed.413) | Question Paper | 2074 | Bachelor Level | One Year | Education | TU"